African views on Syria are well worth considering, and the letter signed by 43 members of the Africa Forum—former heads of state and leaders of international institutions—should be compulsory reading: STATEMENT OF THE AFRICA FORUM ON THE SITUATION IN SYRIA. The central point made is the importance of multilateral institutions and international law. This has been a central theme of African diplomacy since Emperor Haile Selassie travelled to Geneva to speak at the League of Nations, to protest at the perfidy of the great powers of the day, when his country was subject to Fascist aggression and chemical warfare. Africans harbor a deep distrust of the intentions of the great powers of the day, and see that the rights of less powerful nations and the citizens of those nations are best served by a multilateral framework and international law. Africa has also been the location of the largest number of international military interventions, including most recently Côte d’Ivoire, Libya, and Mali. There are lessons to be learned from these. Africa has enormous experience in the resolution of civil wars. 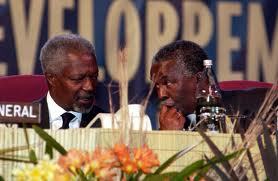 African experience is that wars are ended through political negotiation. Military intervention, with either the stated or unstated object of regime change or (its counterpart) total defeat of an insurgency, does not end conflicts, but at best mutates them and at worst escalates them. The African Union is not averse to using force–it typically is the first responder in the most difficult situations such as Darfur, Somalia and Mali. But African practice underscores the importance of using force in support of a political-diplomatic strategy, not as an alternative to one. African experience has contributed to a number of guiding principles for conflict resolution, notably an insistence on all stakeholders being involved in negotiating a settlement. Were the Syrian conflict taking place on the African continent, all the neighbors would be engaged in a forum seeking a settlement. The AU has also adopted relevant principles into its own Constitutive Act, such as suspending governments that come to power through unconstitutional means. In July that provision was applied to suspend Egypt: a decision that, controversial at the time, has appeared more and more appropriate as the weeks have passed. I do not agree that Africa has great experience in resolving conflicts. I also do not agree that ”African solutions to African problems” in the current state of affairs in Africa(many African leaders are yet to embrace human security virtues in their countries). The AU has been a dismal and hopeless performe that cannot be relied upon to save poor Africans from decimation by state violence(read the case of Darfur, which it claims it has helped). 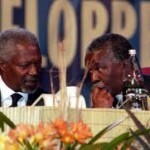 Africa leaders or former African Presidents cannot therefore purport to advice others. The AU failed the people of Siera Leone, Liberia, Rwanda, DRC, Chad, CAR, Mozambique, Uganda(Northern Ugandans under LRA terror). Shame on the likes of some of the former and sitting Presidents for dining with ICC war criminals and yet they cannot tell them to stop genocide against its own citizens. 1. Negotiations- all the fighting groups, including al qaida affiliated ones should come together to a negotiating table without conditions. There is a stalemate now. Plan B- The stale can only be broken if the opposition groups are fully armed so as to tilt the balance of military power to their side and the IC(including Russia and China) imposes an air blockade on Syrian air force.